take a picture it’ll last longer! Well folks it’s finally ready to be announced – my next exhibition in the Ulster Hall starting on thurs oct 27th and I cannot wait! but even more importantly there’s a competition running to pick 12 new snappers to have a pic exhibited alongside the main show. 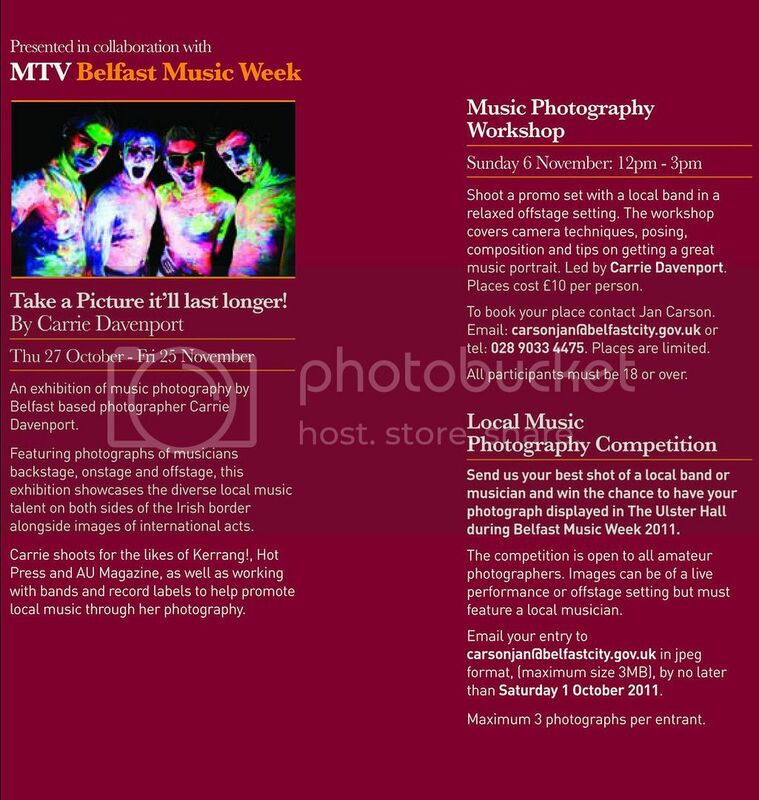 We’re looking your best photo of a local band or musician to be shown in the Belfast Music Exhibition. It’ll be in the Ulster hall for the whole month so it’s a great opportunity! And now for the boring bit – the rules!! DEADLINE is OCT 1ST 2011 anything after that will not be considered. Open to amateurs only and you can send a max of 3 pics per person. If you are a professional photographer in any field or making money from photography even part time then entries will not be accepted. Please name files by the band name and your name – especially if your name is not in your email address. Names are needed for the crediting and display of photos and will not play a part in the judging. only 12 images will be selected for the final show which will be hung in the corridors of the ulster hall alongside the main exhibition. Selected entrants will be notified by email and invited to the launch night of the exhibition and able to bring guests. Photos can be live or portrait shots as long as they include a local musician or band, by local we mean anyone irish!